She appeared before us, bold, rusty and regal and like humble servants, we gravitated towards her, unable to resist her magnetic pull. Given the vast nothingness that lay before and around her, she did not creep up on us slowly, like the peak of a mountain might as you commence the ascent. Rather, one moment there was nothing but red dirt and grass, then the next, there she stood, unavoidable on the otherwise flat desert scenery. Uluru. A true chameleon. In the dry she is at her most vibrant, her red coat resplendent in the sun. In the wet and cold she sleeps quietly, surrounded by cloud. Her purple hue is softer, but she is no less formidable; a sleeping dragon, waiting for her hibernation to end. Whilst her core may stretch over 5 km deep, it felt like her heart lay bare above us and I could almost hear it pulsing as I walked in and around her shadow, desperate to find shelter from the afternoon sun. Despite being August and the middle of winter, my pasty skin was like tinder and already beginning to glow. We took an anti-clockwise direction around her base, against the flow of traffic but with the sun at her back whilst it was at its warmest. At first the path drew us in to see her curves and surprisingly lush greenery, but when we were almost close enough to touch her weathered scars, we were flung out again where we were to admire her once more from afar. This was not the first time I had been to The Rock. Last time I saw her she had snow on her head and frost at her feet, a rarity in the dry, warm Australian Red Centre. My visit before had been during a different time. Whilst once it may have been irresistible to follow the well worn track over her back to catch a glimpse of the scenery from above, today the urge to climb her seemed misplaced, wrong. Today it was more than enough to admire her beauty from her base and as the sky began to deepen that evening, her beauty intensified. Someone had switched on a light inside of her. Drivers pulled over their vehicles, walkers stopped to stand still and a thousand cameras chirped like crickets in the night. Her hold was undeniable; her power difficult to ignore. 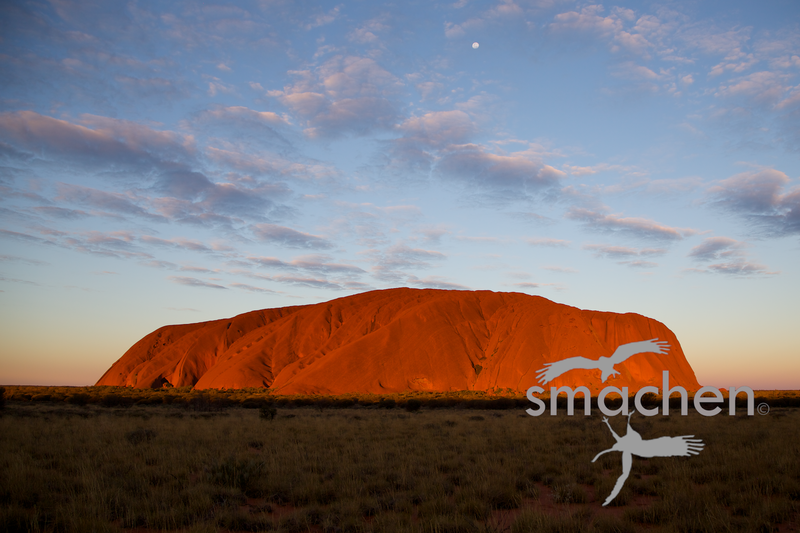 More than just a rock, Uluru has spirit. A real queen of the desert.